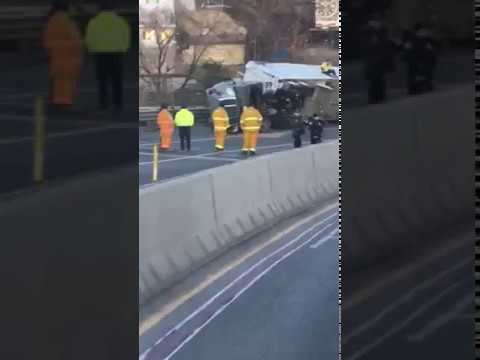 An overturned tractor-trailer on Route 495 near the Lincoln Tunnel created major delays and chaos for New Jersey commuters Wednesday morning. The incident occurred on the westbound side of the highway in Weehawken, near the tunnel's New Jersey exit, closing westbound lanes. Bus service delays of up to one hour were reported by 511nj.org as of 8 a.m., with service diverted to Hoboken and Weehawken. NJ Transit bus tickets are being accepted on NJT rail, PATH at Hoboken and NPS, NY Waterway at Hoboken (north and south), Edgewater, Port Imperial and Lincoln Harbor terminals. The incident left commuters stranded at bus, ferry and rail stops. Photo by AhlamO on Twitter: "Seriously, WHAT is happening? This is the line at my stop this morning. No NJ Transit buses in sight at stop 21890. #njtransit #fail @NJTRANSIT_NBUS @NJTRANSIT"
Kennedy Boulevard was also closed in both directions between Baldwin and Willow avenues' exit ramp to the tunnel in Weehawken. Many cars opted for the GW Bridge, where there was a 3-mile backup.